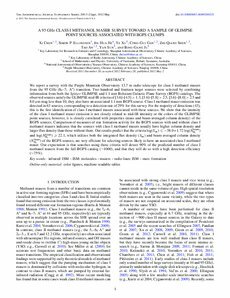 We report a survey with the Purple Mountain Observatory 13.7 m radio telescope for class I methanol masers from the 95 GHz (80-71 A+) transition. Two hundred and fourteen target sources were selected by combining information from both the Spitzer GLIMPSE and 1.1 mm Bolocam Galactic Plane Survey (BGPS) catalogs. The observed sources satisfy the GLIMPSE mid-IR criteria of [3.6]-[4.5] > 1.3, [3.6]-[5.8] > 2.5, [3.6]-[8.0] > 2.5 and 8.0 μm mag less than 10; they also have an associated 1.1 mm BGPS source. Class I methanol maser emission was detected in 63 sources, corresponding to a detection rate of 29% for this survey. For the majority of detections (43), this is the first identification of class I methanol masers associated with these sources. We show that the intensity of the class I methanol maser emission is not closely related to mid-IR intensity or the colors of the GLIMPSE point sources; however, it is closely correlated with properties (mass and beam-averaged column density) of the BGPS sources. Comparison of measures of star formation activity for the BGPS sources with and without class I methanol masers indicates that the sources with class I methanol masers usually have higher column density and larger flux density than those without them. Our results predict that the criteria log (Sint ≤ -38.0 + 1.72log(NbeamH2����) and log(NbeamH2����) ≥ 22.1, which utilizes both the integrated flux density (Sint) and beam-averaged column density (NbeamH2���) of the BGPS sources, are very efficient for selecting sources likely to have an associated class I methanol maser. Our expectation is that searches using these criteria will detect 90% of the predicted number of class I methanol masers from the full BGPS catalog (~1000), and that they will do so with a high detection efficiency (~75%).